Two Miami Faculty Win Top Research Award in the Field of Arts Entrepreneurship. Willie Caldwell (L) and Todd Stuart (R) with the SAEE Award. What does it take to be an artist in the 21st-century? This is the question that Miami faculty Todd Stuart and Willie Caldwell used as the foundation to create the Arts Management and Entrepreneurship curriculum at Miami University. This summer, the duo took this question on the road and interviewed eleven thriving Miami University College of Creative Arts alumni successfully working in the arts in New York, Chicago, Los Angeles, and Cincinnati. The resulting research won The Society for Arts Entrepreneurship Education Gary D. Beckman Research Award in Arts Entrepreneurship at the annual Society for Art Entrepreneurship Education Conference in Boulder, Colorado. The award is the top research award in the field of Arts Entrepreneurship. Stuart and Caldwell received the award for their work in developing a new model for educating artists in the 21st-century that consists of three vital elements: (1) Artistic skill set and practice, (2) foundational skills in arts management, and (3) entrepreneurship and innovation in the arts. The new model found validation in a series of qualitative interviews with Miami College of Creative Arts Alumni that they conducted over one summer. The interviews are now being transcribed into case studies for further study and use in classes. The research was supported by a grant from the College of Creative Arts and the Center for Teaching Excellence. "I am proud of our accomplishments over the past 2 ½ years." shared Stuart, "We grew enrollment over 300%. We serve students from all divisions and 37 majors. This national recognition of our work is proof that we are providing the educational experience that our students need to create and maintain sustainable careers in the arts. We could not have done this without the generous support from Dr. Liz Mullenix, Dean of the College of Creative Arts, and the dedication of all the thriving artists in our program." The Society for Arts Entrepreneurship Education is an organization committed to advancing formal training and high educational standards for arts entrepreneurship education. Dr. Gary D. Beckman is the most cited researcher in the field of Arts Entrepreneurship. A long-time leader in Arts Entrepreneurship, Beckman is a co-founder of the Society for Arts Entrepreneurship Education and, through his teaching, mentoring, and research has inspired numerous students and academics both nationally and internationally. 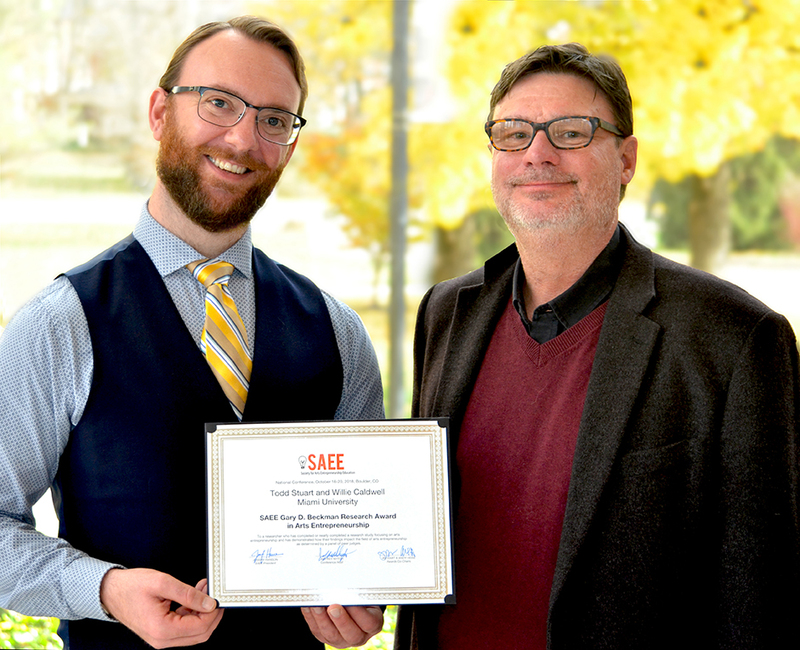 The President of the SAEE, Josef Hanson, stated that the "SAEE's Gary D. Beckman Research Award in Arts Entrepreneurship is the top scholarly award in our emerging field. In naming it after Dr. Beckman, the preeminent scholar in arts entrepreneurship, we sought to recognize pioneering research that embodied his rigorous, thought-provoking approach. Todd and Willie's work on a new educational model for the 21st-century artist exemplifies this type of pioneering scholarship-- research that can exert a profound influence when put into practice. The SAEE Board and I are so proud of them and truly appreciate the work they are doing at Miami to enhance our field, which is increasing in stature both nationally and internationally among scholars and practitioners alike." Both faculty members felt honored to receive recognition of their dedication to the field. "It is an honor to have the arts management & entrepreneurship program at Miami validated by our peers and colleagues." said Caldwell, "The arts are so important to our economy, our educational development, and what it means to be human. Management and entrepreneurship are such a critical part of artistic practice and to have the educational model we have developed here at Miami endorsed by SAEE really means a lot."